You don't have to SPEND HUNDREDS of $$$ for quality dog training!! Most importantly, "Uncle Allie" is well-known for his expertise & deep concern for animal owners and their pets. Allie Lee also conducts the Greenbelt Dog Training Marching Drill Team. The parade drill team has won many trophies and awards in parades in the District of Columbia and also the parades in the Maryland suburbs: Berwyn Heights, Brentwood, Burtonsville, Cheverly, Greenbelt, Hyattsville, Laurel, Rockville, Silver Spring and Takoma Park. 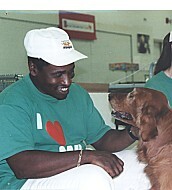 His students in the Advance/Intermediate classes also participate in obedience demonstrations in community events, nursing homes, hospitals, special schools and Pet Expos. Owners are taught how to train their own dogs with POSITIVE VERBAL PRAISE AND TOUCHING. Allie teaches the best, humane and effective ways in the proper use of corrections. Individual counseling is always available to ALL students addressing ALL aspects of behavorial problems such as housebreaking, jumping, mouthing, excessive barking, etc. "Uncle Allie" believes that TRAINING makes even a GOOD dog BETTER and your dog can become the "model obedient dog" in your community.